Completed in 1897, the British Columbia Parliament Buildings are the center of British Columbia's politics as the Legislative Assembly. All members of Parliament must attend the meetings here to pass provincial bills into law, approve finances and scrutinize government. The history of provincial government actually started in BC when the legislative process was based in Fort Victoria up to 1860. Subsequent permanent buildings were used between 1860 to 1898 as the province grew. These wooden buildings, nicknamed 'The Birdcages' due to their design, were eventually deemed inadequate. Leaks and drafts were cited as commonplace, especially in wet weather. A competition was held to design a new building and won by a young British immigrant by the name of Francis Rattenbury. His winning design is what stands to this day. Members of the public can attend the free 40-minute tours of the interior that are scheduled throughout the year. From September to May the tours are limited to week-days while the rest of the year the tours include the weekends. 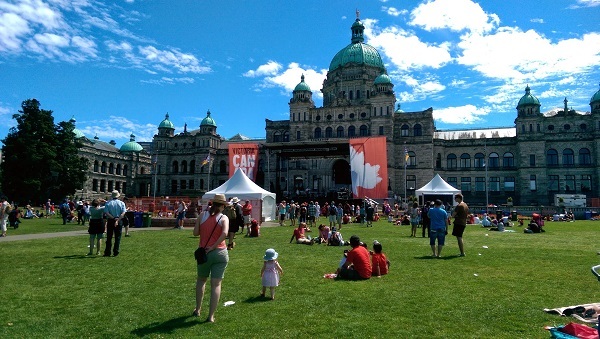 The grounds are often used for major provincial and federal holidays for live music and other events. Weddings aren't permitted on the grounds, but wedding photographs are with limitations. For the rest of the time, the grounds are available for everyone to enjoy.